Financial reports reveal Nancy Brinker, founder and CEO of the Susan G. Komen foundation, received a 64 percent raise for a total pay package of $684,000, and despite Brinker announcing she would be stepping aside 10 months ago, she is still CEO of the charity. NBC's Lisa Myers reports. When the Susan G. Komen Foundation announced last week that it was canceling half of its 3-Day races next year, the charity blamed the economy. But it also acknowledged that its decision to stop providing funds to Planned Parenthood was a factor. In early 2012, Komen announced it was pulling its grants for breast-cancer screenings from Planned Parenthood, drawing an immediate backlash from Komen supporters and abortion rights advocates. Within days, Nancy Brinker, the group’s founder and CEO, reversed the decision to defund the organization. Then, in August, Brinker announced that she would be stepping down. But 10 months later, Brinker still holds her position and tax documents reveal that she received a 64 percent raise and now makes $684,000 a year, according to the charity’s latest available tax filing. Komen says the raise came in November 2010, prior to last year’s controversy. The American Red Cross had revenue of about $3.4 billion, while Komen’s was about $340 million last year. Red Cross CEO Gail McGovern makes $500,000, according to the most recent financial documents available for the charity. Stacey Tillman of Sandusky, Ohio donated a few hundred dollars a year to Komen, but she stopped after the Planned Parenthood announcement. “It just seemed a betrayal of what I wanted them to represent, denying those women that use Planned Parenthood from breast cancer screening and mammography so it angered me a great deal,” Tillman said. The fact that Brinker still heads the organization further upsets her. Rader, also speaking on Brinker’s behalf, says the search for Brinker’s replacement is continuing. “We said last August that she would step out of the CEO job when a new CEO or senior leader is named. That search is continuing, so she remains in the CEO position, just as we said she would,” Rader told NBC News. 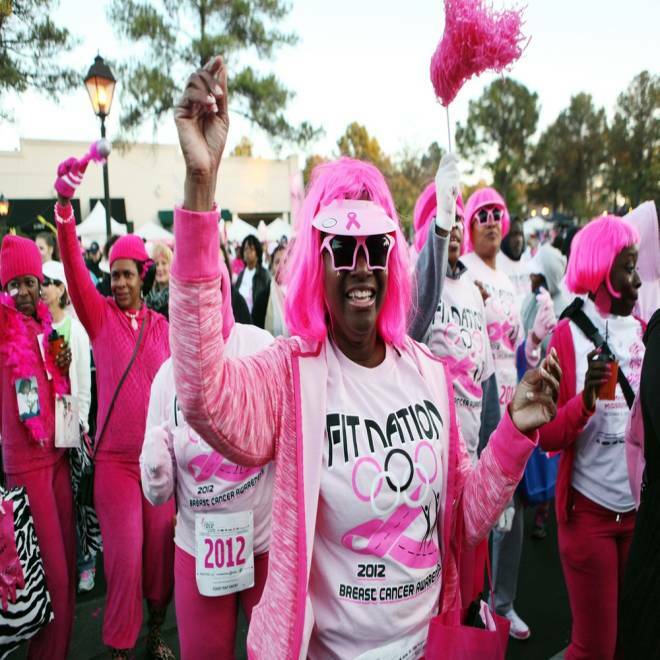 The Susan G. Komen Foundation, the nation’s largest breast cancer charity, was founded in 1982. Since its first race of 800 people in Dallas, the series grew to 138 races with 1.7 million participants around the world. In 30 years, the charity says it has raised more than $2 billion for research and community programs. But the recent drop in race participation has hurt the bottom line. Tamalah Williams, center, dances to warm up for the 20th Susan G. Komen "Race for The Cure" in Germantown, Tenn. on Oct. 27, 2012. NBC News has learned that many of the charity’s affiliates across the country have also suffered financially and that participation in local Race for the Cure events has dropped significantly. In Fort Worth, for instance, race registration fell from 13,780 in 2011 to 8,558 this year. The overall total raised, including sponsorships, dropped by $400,000 in two years. Seattle expects to raise $500,000 less from this year’s race than it did in 2011. Participation fell from 14,000 two years ago to about 9,000 this year, an uptick from 8,500 in 2012. The New York City affiliate was down 41 percent last year, but is hoping for a rebound for the race this fall. Komen acknowledges that the decreased revenue has affected the charity’s grant-making ability. The Global Race for the Cure in Washington, D.C., which funds programs in the nation’s capital and around the world, had a 50 percent decline in race revenue, down from $5 million two years ago to $2.5 million this year. The affiliate issued $3,726,276 in grants in 2012 and $1,577,790 this year. For the first time in five years, Dr. Sandra Swain did not receive a Komen grant for a program to help low-income women complete breast-cancer treatment in the nation’s capital. Swain, who is the medical director of Washington Cancer Institute at MedStar Washington Hospital Center, wasn’t given a reason why she did not get the grant, but she says Komen’s decreased revenue could have played a part. Swain hopes Komen can come back from its current troubles, but Bergen of Charity Navigator suggests it may get worse before it gets better. Lisa Myers is NBC News' senior investigative correspondent; Talesha Reynolds is a producer in NBC News' Washington, D.C., bureau.